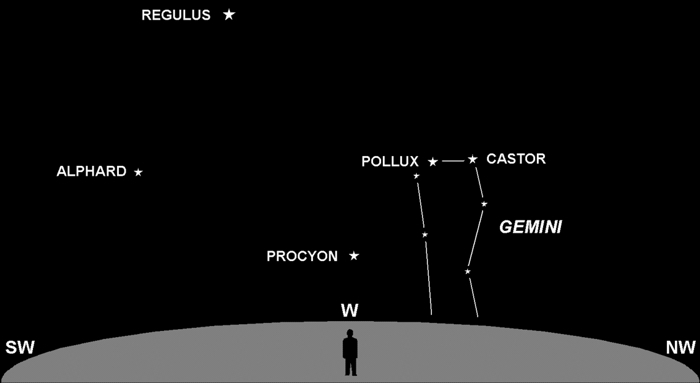 Low in the west, around an hour after sunset, look for the twin stars Castor and Pollux in the constellation Gemini. They are easy to recognize due to their striking visual similarity. If you observe at the same time (8:30 pm) for a few nights in a row, you’ll notice a pattern of motion emerging. The twins will be lower in the sky every night. This motion brings them positionally closer to the Sun — closer in the sky, that is, not physically closer in space. By the end of June they will set with the Sun and be absent from our evening sky. Undaunted, they will reappear in the morning sky a few weeks later, rising before the Sun. This cycle of motion is shared by all stars. They drift westward, en masse, relative to the Sun, at a rate of 1.0146°/day. That works out to 360°/year. So, one year later, they’re back to where they started. That’s why our “year” is 365¼ days long. Our calendar cycle is defined by the motion of the Sun and stars.